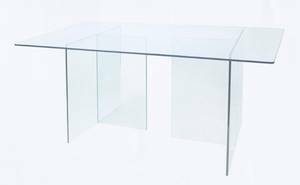 Description A simple yet imposing glass dining table. Each base consists of 2 peices of clear glass UV bonded to form a T-shape. The rectangular table top is placed on top of the bases.